In this article I share what I learned about Pet Turtle Care. Pet turtles may seem like a simple pet to care for. Smaller turtles are sold at low prices and can even be won as prizes at carnivals. They are a favorite pet among children. Turtles do require a lot of attention and special care. There is more to caring for a turtle than feeding it pellets and leaving it in a tank. 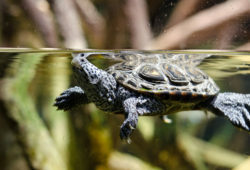 Things such as the temperature of the water, a varied diet, and how much sunlight the turtle is getting are important. Knowing the basics of turtle care will result in a happy turtle and a turtle that lives for a long time. When first acquired, most turtles come in a small tank that is barely bigger than the turtle itself. It may seem unnecessary to put money into a bigger tank, especially if the turtle was one as a prize and no money is expected to be spent on the creature. But it is crucial to get the appropriate sized tank for the turtle. Turtles need room swim around and bask in the sun. Also, the water in a smaller tank will get dirtier much quicker than water in a bigger tank. If the turtle is left confined in a small tank, it will not have room to swim around and get the physical exercise it needs. How big a tank is needed will depend on the size of the turtle. The smallest turtles will usually need only a 20 gallon tank. Once the turtle gets larger, a larger tank will be needed. Within the tank should be an “island”, or a surface the turtle can climb onto to get out of the water. Turtles enjoy basking outside of the water. The tank should also have a heat lamp and a water filter. Having a water filter will keep the water clean for longer periods of time and prevent frequent water changes. The heat lamp is a good replacement for sunlight if direct sunlight does not reach the tank. It will also control the temperature of the water. Turtles also need a varied diet. Simply giving them pellets is not enough. Pellets should make up only a small portion of the diet. A turtle’s diet should be largely plant based and contain moderate amounts of protein. 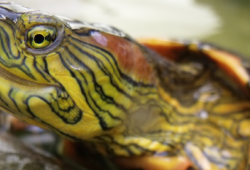 Good things to feed a turtle are leafy greens, such as romaine lettuce and spinach, bananas, and tomatoes. Turtles can also eat small meal worms, but these should not be fed to the turtle on a daily basis. Turtles can also be given calcium supplements that come in different forms. Calcium promotes a stronger shell in a turtle. A variety of calcium supplements should be available at any pet store, so check to see which one is best. Turtles should be fed a varied diet on a daily basis. Even with a water filter, their water should be changed regularly too. Sometimes, even turtles can contract minor illnesses. 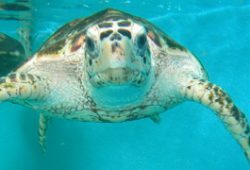 If the water is kept too cold, the turtle may get respiratory congestion or a cold. 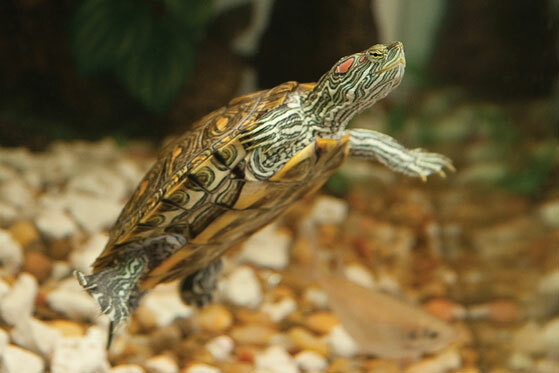 If the turtle begins to make odd noises, check the water’s temperature to make sure it is warm enough. If necessary, take it to a veterinarian. If well taken care off, turtles are able to live for years and be a part of a household like any other pet.